All industrial units feature standardized and repetitive, e.g. press-brakes, plastic or metal moulding, product re-orientation, CNC feeding etc. 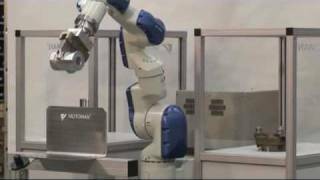 Industrial robots are extensively used in these applications as they offer much higher productivity. Precision in product placing is top-notch and provides for end-product consistency, whereas machine downtimes are eliminated. Thanks to their manufacturing, robots may operate even in clean rooms and -contrary to manpower- they may handle products without running the risk of bacterial infection, thus reducing production costs even more (no need for sterilization ). Robotic flexibility allows for no limitations in the tasks undertaken and enables cooperation with all machinery of an industrial unit.